"Most of what you need to complete the experiments are commonly found around the house. With adult supervision, the results can be just as exciting as delicious food for a hungry young mind. Science can explain the mystery of our universe and help us build a better future." Science is all about asking 'why?' and then using that interest to help find the answers to our questions. Inisde this book and behind its many flaps, you will find great fun and memorable learning. Perhaps it will lead your child to a life filled with discovery and excitement about their world. Take a look at its content, head to the kitchen and make some discoveries on your own while you help little ones experiment with common materials and a sense of wonder. Everyday science using everyday materials, what could be easier? 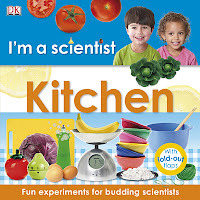 Learn about density, static electricity, structures, magnets and more...in this guide to help children learn basic science understandings and methodology. The experiments are well designed, giving clear directions and providing brightly colored photographs to help in following the method. Simple explanations are provided for each concept and a lifted flap uncovers the science while offering ideas for follow-up procedures. "Your goo is sometimes a solid and sometimes a liquid! That's because the corn starch doesn't really dissolve in the water. Instead, it forms a suspension of tiny, solid pieces that hang around in the water. Scientists call this strange stuff a colloid." As is usual, and so much appreciated with DK nonfiction for the young, the photos make each step in the process easy to follow. 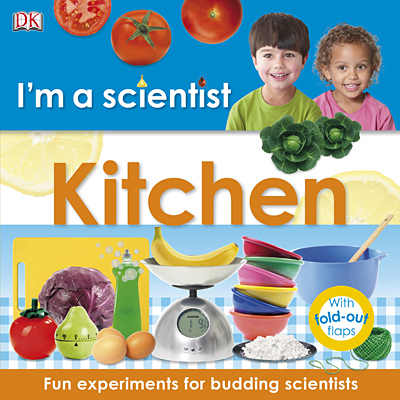 Large numbers guide parents and young scientists through each experiment. Bright photos make it very clear what is needed to complete it, and the pattern is similar as readers move from one guided experience to the next. A glossary and useful shopping list add to the value so apparent in this amazing series. Check this out if you want to be part of DK's WHAT DID YOU MAKE ON SPRING BREAK Contest. It's running until the end of March! "She yelped and hopped up on a small wooden crate. Her weight, however, proved too much for the box, and one leg crashed through. The rat skittered off into the shadows, but Clara was stuck. The heart she had just lectured now pumped furiously as she pulled at her knee to free her foot. Her hem ripped before her stocking foot came out - bootless!" "Clara almost couldn't bear to watch. The sharp bones of the old woman's spine seemed ready to break through the skin. And her lovely white hair was damp and stringy, showing her naked scalp. After Mrs. Glendoveer coughed into the hankie one last time, Harriet motioned for Clara to bring the bed jacket. She clothed Mrs. Glendoveer and laid her back gently, propping her upright with pillows." The mansion itself has a presence and takes on a life of its own, with its many rooms, hidden secrets, eerie sounds and found treasures. 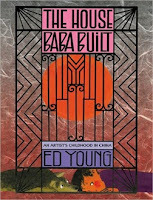 It is a great setting for this story of a magician, his family and his partner in their magic show, Mr. Woodruff Booth. While their parents are away in Europe performing, the Glendoveer children are kidnapped and later found drowned...all five of the older ones, and the baby Elliott was never found. "Clara stood absorbing all the sound until it resonated in her bones. In her mind, the bits and pieces of everything she had gleaned about the Glendoveers' story held together. She had a picture now! The blue embroidered poem, barely perceptible at the bottom of Mrs. Glendoveer's mourning picture. None shall fly till all come home..."
This is not an easy read and will be appreciated by those middle graders who love a good story, with multiple characters, many twists, some scares and a touch of magic and deceit. A cast of carefully drawn characters, a hint of mystery and old fashioned intrigue captured my interest and kept me reading late into the night. Blessed be retirement that allows sleep-ins when such things happen! "But when the first Little Pig brought her feather home to her den, she discovered that Bear had moved in - which she didnt' mind, because she liked Bear. But Bear was so big that - oh, dear! - the den was wrecked." Ooooh! I love these illustrations that are so suited to this charming story of great friendship. When the two Little Pigs go for their morning constitutional they have no idea that life as they know it will have changed by the time they return home. We get to watch their discovery! Returning with a newly found feather for one, and an interesting stick for the other, they find that Bear has moved into one's den and Moose into the other. Even the smallest child will recognize the incongruity of a Bear trying to live in a Pig's wee den...not much different with the Moose. Of course, both dens are now uninhabitable. Poor Pigs! Nothing to be done but to find a new home. All are amenable to do just that, and it doesn't take long to decide what and where. Moose wants them to consider constructing a building that will house all of them together. Having no skills for design or engineering, they look for the most obvious forest animals to aid in the construction....the Beavers. A quick phone call and a promise to pay their fee in peanut butter sandwiches makes it a done deal! 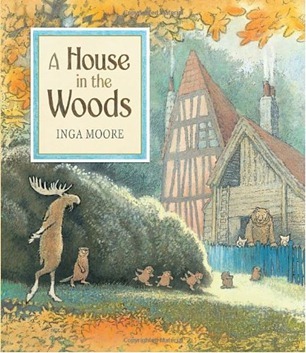 "Bear made the staircases and chimney stacks, while Moose fitted the windows and doors. Then they both went with the two Little Pigs to the junkyard for furniture and curtains and all the other things that go inside a house." Building complete, bill turned over, there is only one thing left to do...a trip to the store for bread and peanut butter. Delivery of said payment results in contentment for the builders, and great delight for the new inhabitants. It is a lovely house with all the amenities needed for a lifetime of shared happiness. "Soon the only sounds to be heard were the soft cheeps of sleepy birds roosting in the rafters, the tiny rustling of wood mice in the fallen leaves outside, and, just now and then, the gentle snoring of Bear." 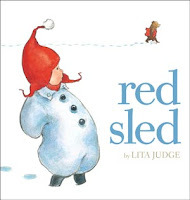 Snuggle up with this lovely book on a cool winter night, and enjoy a wonderful family time! "The river has done damage. It has washed soil from its own banks. But in the swamp, tree and plant roots cling on to waterlogged earth. By slowing the river water, the swamp keeps more soil form wearing away." Tundra has just published the first three books in a new series called the Ecosystem Series. This is the first one that I have read, and found it to be informative and accessible for young readers. Karen Patkau provides 'just enough' clear information on each double page spread to keep her readers interested and moving forward. She fills her collages with intense color and abundance to show a coherent view of this ecosystem and its many inhabitants. We become aware of the wildlife in her vivid descriptions of the sounds and sights in the swamp and through her carefully constructed artwork. The constantly changing page designs encourage her audience to search carefully through the text for clues to what is happening in the art, and the art is filled with details that have the child's eyes searching for each new and delightful discovery. Duckweed spreads by sending new leaves out from its sides. Its floating roots trap polluted sediment in water flowing into the swamp. Cleaner water trickles out." When chased, the swamp rabbit makes zigzag hops right into the water. Here it waits underwater, until it feels safe. Only its nose sticks up into the air." Fascinating and fun learning, that's the best kind of nonfiction for young readers! Don't miss the other two books in this brand new series, Who Needs a Jungle? and Who Needs An Iceberg? "Moody didn't ask Ollie why she wanted to go to the Koppel place. Unlike Sheriff Burton, he didn't warn her against the horrible things that would happen to her precious soul if she befriended the boy. Unlike Mrs. Mahoney, he didn't assume she'd be over her head in trouble. He just pointed out the way and let her go." Here's a family you won't soon forget! And, the mystery that draws them to the people of the small town of Binder, Arkansas makes it a compelling and quick read. It's hard to put down once started. When the Reverend Everlasting Love and his family set up in a farmer's field just outside town for their three day revival meetings, they have no idea that Binder is a town with secrets. It is Olivene (called Ollie) who makes the discovery and asks her father for help in getting Jimmy's mother our of jail. What Ollie has learned from Jimmy is that his mother is not guilty of his abusive father's death and she is wasting away in jail for admitting to it. Why? That is the mystery. Everyone in town believes she did it. How can the Love family help? Well, there is no excuse for someone being accused unjustly of a murder she did not commit. As Ollie comes to know more about Jimmy and his family, her heart opens and she convinces her own family that they MUST stay longer this time. They must put aside their travelling ways to make a difference in this small town. Perhaps the church with the covered-up windows is the answer. Her father can stay, help the town heal and provide Sunday inspiration to those needing it. It is a difficult decision for the Reverend Love. "Ollie knew Jimmy was happy and trying to share his joy, but could see her daddy wasn't taking it. It made her sad, and she thought again of what Martha had said, about how you can't change a person's wandering spirit. Maybe asking her daddy to stay was like asking a stream to sit and visit for a while. Nature just wouldn't allow it." 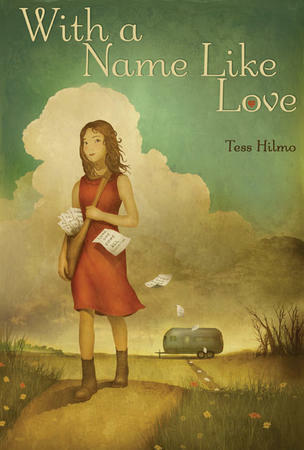 In her debut novel, Tess Hilmo creates a cast of characters worthy of our admiration. Life in the Love family is pretty normal, except for their constant travel. There are five girls and they do not always get along. We catch glimpses of each unique personality with every new encounter. The family works hard to keep food on the table, to move from place to place bringing a positive message of love and peace and they each find solace in helping others. Jimmy is a young boy, struggling to live on his own, visiting his mother daily and using his deep and abiding love of frogs to bring some joy to his life. Moody is a kind and supportive neighbor who helps Jimmy as much as he can, and worries about the hand the young boy and his mother have been dealt. Mrs. Mahoney is wise and generous, offering a home and hope. The Carters, Sheriff Burton and his son, and even the deceased brute who was Jimmy's father are well-drawn and play an integral part in the unfolding drama. The writing is wondrous! "That's what worry did to Jack, made him incredibly tired - tired the way his mom always was after the spinning times. She'd come home and crawl into bed, close the shades, and pull up the covers, and that's where Jack would find her for days - sometimes even weeks - after a spinning time. Tired like that." Truthfully, I didn't think that I was going to be able to read this book. It begins with Jack who is 11, and his mother. They are in a campground in Maine; arriving late, setting up both tents and going quickly to sleep. Morning finds his Mom, her tent, her car gone. How could that happen? What kind of mother is she? What will he do? Jack is concerned but determined that he will find her. So, he sets off alone with little to sustain him and no real plan in mind. As we travel the back roads and main streets with Jack, we come to realize that this has happened before, and Jack is wily at keeping secrets. He trusts no one, having learned that lesson well. In previous such episodes, Jack has learned to cover for his mother, thus avoiding being put in the foster care system or having to live with his mother's mother. Anyone he might trust he views with a skeptical eye and avoids spilling his doubts, fears and secrets to them. No money, no way of contacting his mother, and virtually nothing but what he has on his back, what will he do? What he has always done...stick to himself and find a way to survive on his own. He has never been alone in the wide world before....he has always been at home, in their apartment with neighbors close by. It is a gripping adventure, and often uncomfortable for my mothering instincts. He breaks my heart; but, Jack is a fighter and does his best to take care of himself. He is such a mix of old soul, and young boy. His story is a mixed bag of wanting to be independent and make it on your own and being gripped by the fear of being left alone to fend for himself. You cannot help but cheer him on and hope that when the time comes to make the best decision, he will be able do it. "If anyone wants to know what elephants are like, they are like people, only more so. Jack learns two life lessons during his journey. One is raw, one is life-altering. Ashamed of it all, of everything that he had done. In between sobs, he thought it. "...he had never really been alone. He had been part of a makeshift herd, one that spread out for miles. They had communicated heart sounds that were sometimes so soft, they weren't always discernible to the ear. But they had found one another, and they had helped one another. Just like a true herd." because you didn't touch me. because he wrecked our family. because she slept all day. You don't need a lot of words to tell a great story; but, you need wonderful words and form to tell it well. Sarah Tregay knows that. She gets it right the first time! In her debut novel, she constructs a story in verse that is honest, and filled with all of the uncertainties of being sixteen, dealing with a family break-up, leaving your friends behind, and first love. Marcie and her mother are in Durham, New Hampshire and school is about to start...new school, new year...everything new. They have come to New Hampshire to get away from Boise, Idaho. 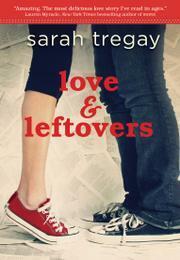 In Boise, Marcie's Dad is living with his boyfriend, Katie and Linus (her best friend and boyfriend) and the rest of the Leftovers are starting their own school year and life is going on without her. I don't remember a lot about being sixteen. I suspect I might have felt exactly that same thing. two people at one time. When her dad visits at Christmas, the decision is made for Marcie to return to Boise with him. Her mother needs time to heal and find new meaning in life, her dad loves her and wants her with him. Marcie is on the move again. Returning to Boise and seeing Linus boosts her feelings of guilt and she tells him about J.D. The fallout is predictable. Life goes on without Linus, without Katie, and without the Leftovers. Everything has changed, and Marcie is more confused than ever. Fully-developed characters, first person narrative, honest emotions, relationships, courage and the fragile nature of first love...they are all here and they work at creating a compelling story. Marcie's poetry journal gives us insight into the depth of the emotions she is feeling, and hope for her future. "“Who we are,” he said, underlining each word as he said it. “Who we are! Us! Right? What kind of people are we? What kind of person are you? Isn’t that the most important thing of all? Isn’t that the kind of question we should be asking ourselves all the time? ‘What kind of person am I?’"
How lucky am I that I keep reading books that yell to be shared? After reading The One and Only Ivan, and fervently wishing that there was a classroom somewhere that I could share it with, Wonder rises to the top of my TBR pile! It is a book that packs a powerful punch and should be read in every fifth grade classroom...and don't stop there. 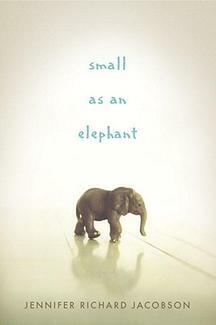 It is a story that should be read and savored by anyone who loves books that will impact the way we live our lives. 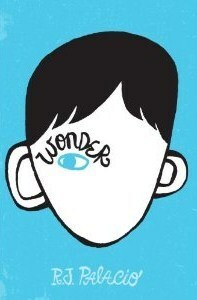 It is a 'wonder'! 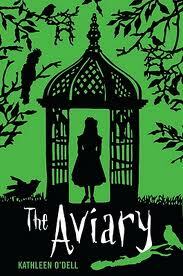 It is August (Auggie) Pullman's story and is brilliantly told. Auggie was born with mandibulofacial dysostosis, a hereditary condition that causes numerous facial defects. He has had many surgeries, been home schooled, and is now entering public school for the first time. He is in fifth grade. That in itself is daunting. Auggie is constantly aware of the reactions of others when they first see him. He has become accustomed to it, which is quite different that being able to understand or harden himself to it. "Like, it's okay, I know I'm weird looking, take a look, I don't bite. Hey, the truth is, if a Wookie started going to school, I'd probably stare a bit!" Auggie's voice is compelling, honest and ordinary. He deals with all things fifth grade. He is brave (he has to be given all the surgeries he has faced and the everyday difficulties of eating, hearing and being different), he is funny (luckily) and full of resolve. He is a character to be admired and emulated. The kids in his school are like all kids in schools everywhere. They have had little experience with a kid like Auggie. They snicker, they point, they ostracize and they show fear. They say mean things when no one is listening, they feel embarrassed by their reactions, and many learn to be better people through understanding and empathy. Olivia, his older sister, is in grade nine and has her own take on life with Auggie. While she loves him unconditionally, she wants her life in high school uncomplicated by her classmates knowing about her brother. She tells her story with honesty, with compassion and with guilt for self concern. She only made me love her more for voicing some of the frustrations she deals with in having a loved brother who faces great difficulty in life. Now, get out there and get a copy for yourself, your child, your child's classroom or school library. You will NEVER forget August Pullman, and you won't want to either! "I meditated every day and practiced the cat walk while holding the pole up high. I kept hoping Grandpa would teach me to whack things with the pole. But by the time New Year's came, I still hadn't gotten to hit anything." 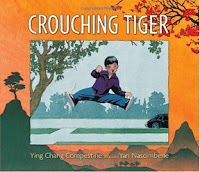 I was delighted to see this story that celebrates the Chinese New Year, as well as the martial art known as tai chi. Celebrations were held this past weekend and many people were in attendance to learn about the Chinese culture. And, my friend practices the discipline of tai chi weekly to improve mobility and because she has come to enjoy it immensely. So, I read it with personal interest beyond the warm and inviting story it tells. "..., Grandpa was dancing slowly in the garden with his eyes closed. His hands moved like gliding birds. He crouched like a tiger; he drew an invisible bow; he lifted a foot like a rooster and stood still." When he learns that tai chi is a martial art, Vinson is thrilled. He imagines himself a kung fu artist, with a little help from Grandpa. Unfortunately, when the training begins in earnest, it has none of the flash and panache that Vinson has been expecting. Rather, Grandpa shows him standing meditation. What? Just stand, hold an invisible balloon, and breathe? It is not at all what Vinson had in mind. "The martial artists led the way. They leaped and whirled about with spears, swords, and other weapons. Grandpa signaled and I marched off, focusing on keeping the cabbage just out of the lions' reach." The exquisitely detailed, yet contemplative, illustrations have all the grace and peace of the practice of tai chi. On one side of each double page spread is the text and a small captioned demonstration of the positions that Vinson is mastering. Facing that is the warm and lively ink and watercolor artwork that shows a young boy learning about, and from, his patient and revered grandfather. "Sometimes Jessie helped carry unusual things. She made sure to go slower around the curves so everyone - and everything - arrived safe." "When Jessie was born in St. Louis, Missouri, she weighed 75,122 pounds and was 51 1/2 feet long." Now, that is some auspicious beginning, wouldn't you say? Of course, the fact that Jessie is a subway car explains it. Her home is New York City and she travels from place to place with a sense of accomplishment and pride. As times change, Jessie does the same...as do her passengers, and the city itself. Always, her job is to move people safely from one stop to another. As the aging, travel-weary cars are replaced by sleek, silver bullets, Jessie must pass her time in a dusty yard with all the other trains that have been retired. She wonders about her many passengers and if they even notice that she is no longer their transport. It's sad. "Instead of fixing her, the people were taking Jessie apart. Off came her lights, her signs, her brakes, and her horn too! and left her with a group of other cleaned-up subway cars." I was surprised when they loaded her onto a barge and headed out to sea, and even more so when they dumped her over the side and into the Atlantic Ocean. There she becomes another kind of bustling and vibrant city. As the fish and barnacles, the bigger fish and plants gravitate toward her on the ocean floor, Jessie becomes an artiificial reef. 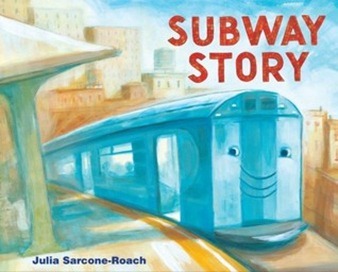 Based on a true story, Julia Sarcone-Roach has created a charming character whose lot in life is touching to her readers. Her writing is natural and appealing. Her lovely acrylic artwork gives life to Jessie and her environs, above and below the water. Her strong colors and constantly changing perspectives are infused with light and shadow allowing readers a feeling of gentle movement throughout this lovely story. It is interesting to watch as the years pass how the passengers change, and how the subway system itself changes. I absolutely love the mosaics. An author's note explains the origin of the story, a list for further reading is provided, as well as a bibliography for those who just want to know more. Keeping with the 'love' theme, I want to tell you about this book-loving dog who decides that a owning a bookstore is the course he will set for his immediate future. With experience in doing the same, I knew some of Dog's trials and tribulations when I set out to read his story. It's a tough go for many! After 12 years of trying, while working full time jobs as well, we decided that we just couldn't do it anymore. Our love of books for children and young adults never waned, our desire to get the right book in the right hands continues; but, the book buyers in our small prairie city could not support our dream of being one of those bookstores that endures. My hat is off to those who do! When he opens his own bookstore and finds that customers are not beating the door down to get in, Dog is discouraged. Not being one to wallow in his own misery, he finds himself picking up first one, then another, and still another book to read while he waits for someone to come through the front door. It takes no time for him to be immersed in story, wandering new worlds, and becoming an expert on the books that fill his shelves. No matter who comes through the door following these discoveries, Dog always has an apt suggestion. As librarians, teachers and booksellers know, the more stories we have read, the more easily we find the 'right' book for the 'right' child at the 'right' time. It takes perseverance, a lasting love of the written word and the need to pass on our passion for reading. Isn't that the best job in the world? Isn't that true of each one of us? Ivy is a gentle and generous wee girl who loves to share and wants everyone in her family to feel the joy that she gets from giving. Lucky she is to have an older sister who is as kind and thoughtful as Ivy is. When her sister agrees to let her wear the tutu, Ivy gives the best gift of all...her love and a big hug! I so admire the pencil and watercolor artwork, placed on cream-colored, uncluttered backgrounds. 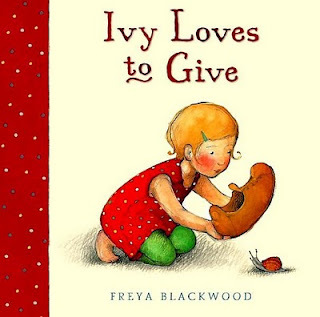 They give full attention to the family doings, and Ivy's sweet nature. Evidently, gift giving is her thing...to the goat, a snail, the dog, a chicken and finally the piece de resistance...the cat gets the baby's soother while Mom is obviously in need of it. A lovely gentle story to share with your Valentine! who had a great heart." Talking about picture book biographies has me very excited these days. First, the number of exceptional books about important people and events is growing exponentially. I have always had an interest, and feel that a picture book is a perfect introduction to some of the most interesting people, well-known and often unknown. They offer revelation and information for young readers, and can lead to a lifelong interest in a particular person and the part they played in shaping our history. I have heard Raoul Wallenberg's name. To tell you that I knew anything about him would be a lie. I could place him at the time of World War II; but, that would be it. No longer true. After reading this remarkable and brilliantly researched story, I feel that I know him quite well. As any avid student in your classroom might do following reading this fine book about him, I want to know more. I don't think that is unusual. He was a compassionate, caring man whose life and work made a difference in the world! and, still, the abuses against the Jews. But there were no deportations to Auschwitz." 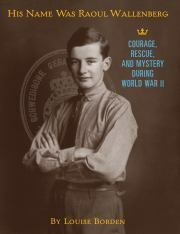 and the name Wallenberg always brought hope." "Since then, I've traveled several times to Sweden to meet with Raoul's sister, Nina. We walked the wooded paths at Kappsta on the island where Raoul was born and drove along the "street of the knight" in Stockholm. I've held Raoul's calendar and address book - brought back from Moscow - in my hands." Tell me that's not impressive, and motivating when crafting the story of one of the world's heroes...a man who made a difference in his world. It is a powerful study...a book about the Holocaust told with honesty and honor. Don't miss it! Looking to warm a cold winter day with conversation and a cuddle? I have just the book for you. Wordless picture books have such appeal for me, and I love adding to my collection. There is so much to see in them, and to learn from them. I have been encouraging teachers and preservice teachers to think about using them with all students. They will have a special appeal for our students who are learning English as their second (or third) language. Wordless books are stories to be enjoyed in all languages and often offer universal experiences to be shared. Visual literacy is an important aspect of every child's education. What better way to enhance it than with an extraordinary stack of wordless 'stories'? Red Sled has instant appeal...a small bundle of child watching contemplatively as a brown bear heads somewhere, red sled tucked under its arm. And oh, that smashing red hat! Now, to the story. A still and frosty day, the chimney smoke rising straight up into the atmosphere, that same small child heading home after a day of sledding. The sled leans sedately against a weathered cottage wall, while night descends and light beams from a snowy window. An inquisitive bear looking for adventure, intrigued by the unternded sled...too much temptation! Evidently, the forest animals are all looking for adventure. They soon join their pal for an evening of fun on the snowy slopes. No one wants to be left out. Like kids, they ride faster and fuller until they cannot do another run. Bear returns the sled and off they go, tired and ready for slumber. The following morning the child makes a thrilling discovery of his own and is not reluctant to act upon it! Another snowy evening, another visit to the cabin, a new rider...perfect! The pencil and watercolor artwork is full of wonder and delight as readers watch the expressive and suitably excited animals cavorting on a snowy moonlit hill. I couldn't wait to turn the page and pore over each new scene! The sound effects are perfect and invite excited audience participation. The joy of those many downhill rides is palpable and almost makes me want to try it all over again. Not likely, but it sure evokes strong memories of past family fun. You need say little when you fill each page with elegant, beautifully crafted illustrations that will have young readers finding new interest on every one of those pages. 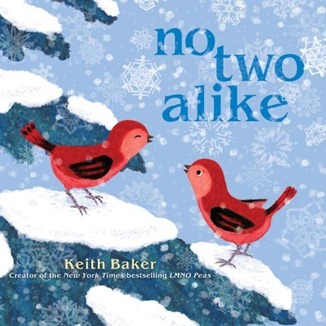 Keith Baker brings his lovely and lively view of a young child's world to his newest book. We have always been told that no two snowflakes are exactly alike. Does that apply to everything in nature ? You may know twins who look like carbon copies of each other. It takes little time to discover that there are slight differences that will set one apart from the other. Keith Baker uses that premise in following two wee redbirds as they explore the snowy landscape that is their home. Off they go, with curiosity and joy, to see their world. Preschoolers are invited to make their journey of discovery with them. Everywhere they look, they see things in pairs. Birds, snowflakes, trees, feathers....they look the same. Look closely and you will see that they are not. Keith Baker has created artwork that perfectly matches the exuberant exploration of this winter outing. It's lovely to visit the snowy landscape with our tiny guides as they flit from nest to forest floor, from tree to fencepost and from river to sky where snowflakes fall in peaceful quiet on every page. It is a gentle message for the very young...we are each unique and wondrous. Despite the season, there is warmth and joy as readers and listeners share the antics of two small birds finding that wonder in their world. MY THANKS TO MY READERS! I can't believe it! And I am so truly grateful to each and every visitor to my blog. It is just about to flip over to 20,000 visits and I can't tell you how thrilling it is for me to see that. I love books, and I love sharing them with you. Knowing that there are readers eager to know what I am reading and posting makes working on this blog such a joy! Thank you for your support, your comments and for following what I am posting here. It makes all the difference in the world to me! He read books and followed all of the advice. He took his dog for a walk in the park. He worked out at the gym. He even took ballroom dancing lessons. But nothing he did seemed to impress the girls." It might be the fact that he offered a box of worm-filled chocolates to the girl at the bus stop. Or maybe it was the human heart he gave his mail carrier. Could it be that the diamond ring (displayed on a human finger) for the diner waitress was just a bit gross? No matter...Mortimer just can't seem to catch a break in his search for true love. and falling down in the rain. if you have half a brain. and I'm dying to meet you!" A come-on if you've ever heard one, right???? No matter what he does at the Cupid's Ball, Mortimer remains a wallflower. The girls just don't seem attracted to his zombie smile....until he meets his made-in-zombie-heaven match. Her name is Mildred and she is perfect. The puns flow freely and make this a book that the youngest listeners will enjoy for the story told, while older readers and listeners will 'get' the many funny jokes. 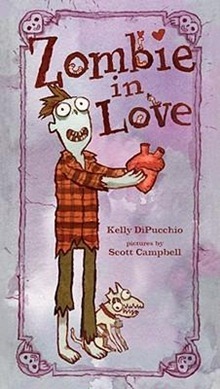 They will be hooting with the hilarious doings that find a life in the wild and crazy illustrations that Scott Campbell has created to accompany this love story for zombies...eyeballs that dangle, legs and arms that fall off with exercise, a suit purchased at a funeral home, worms that act as escorts for their sad and lonely friend. It's filled with fun, and wit, and love. Perfect for Valentine's Day! from the top of the stoop. I'm the queen of the jacks." Here we are in the middle of Canada anticipating a dip in the Arctic air mass due to land right on top of us. Now, that can bring very cold temperatures; but, with a strong wind, it can only get worse! The weather service is telling us that by bedtime the wind chill with be -42...and that is COLD in both Celsius and Fahrenheit. So, I turn to thoughts of summer and watching with delight the many games that kids find to play in warm weather...and outdoors. Each of the poems in Marilyn Singer's wonderful new collection celebrates that play. I chose Jacks because it is a game we loved ourselves as children and I don't often see it being played these days. This hill is small. The grass feels fluffy. Mama says it's called a knoll. We're glad our clothes are old and scruffy. We used to do that...I didn't know it had a special name. Barreling seems apt and descriptive for it. And then the stick...all the games to be played with one. 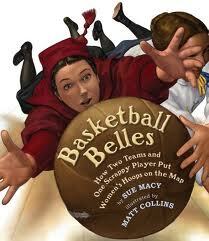 Kids will love to add to the list that she has created for them in her poem about their excellence for magical fun. The illustrations are filled with bold-colored motion, and constantly changing perspectives. 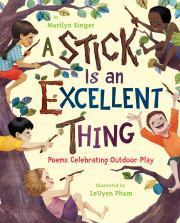 LeYuen Pham peoples her spreads with bright-eyed smiling children who are obviously getting all the outdoor sunshine and exercise needed to keep them healthy and happy. There is so much to see as the poems are shared. A winning collaboration and a most enjoyable read! "In the heart of New York City, in Herald Square, was the "biggest store on earth": R. H. Macy's department store. 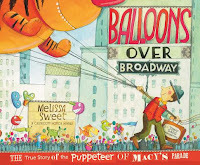 Macy's had heard about Tony's puppets and asked him to design a "puppet parade" for the store's holiday windows." Melissa Sweet is not the first author to spend a number of years working on a book; but she might be among those who had the most fun while working so hard. In the five years spent researching this imaginative and talented man she visited the Nantucket Historical Society three times. Why? Its collection houses an impressive display of Tony Sarg's signature work, as well as vintage photos from the early parades. It must have been like being in the 'best' toy shop! Melissa Sweet has much in common with the subject of this sparkling picture book biography. Her love of toy collections and her ability to design and build them are just two such shared interests. It is obvious as this book is read that she spent hours figuring out the best way to display all that she was learning. Tony Sarg had an intense infatuation from a very early age, building a chicken feeding system using pulleys when he was only six. This simple machine ensured that his chore was done without ever having to leave his warm and inviting bed in the early morning. The interest never waned. When he was older he went to London to learn how make puppets and used that knowledge to create characters that made his shows smash hits with his audiences. Those shows led to work in New York, attention from Macy's, and a chance to design some spectacular window displays for the holiday season. Not one to rest on his laurels, and interested in Macy's concern for their immigrant employees who were missing their cultural celebrations, Tony took on the task of helping to stage the first Macy's Thanksgiving Day Parade. 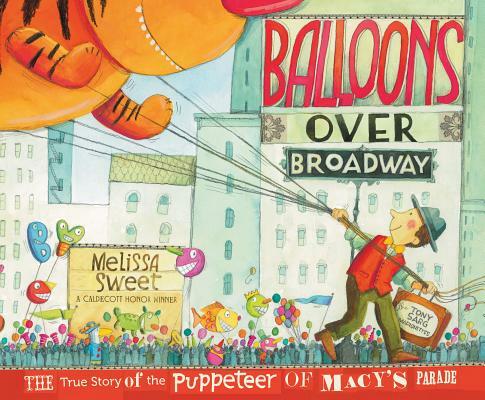 Making it an annual tradition allowed Sarg to use his imagination and ingenuity to create the balloons that are now such a symbol to the 44 million people who watch the parade, not to mention the more than two million who line the streets of New York to be there in person. "I have never done a stroke of work in my life." What wonder there is in work that is loved and well done. The author uses her note to give an overview of Tony Sarg's life work, then adds a source list that will be most helpful for anyone interested in knowing more. "To create the art for this book, I began by making toys and puppets. I played with all sorts of materials, not knowing exactly what the outcome would be. In addition to the watercolor illustrations, my collages are, in part, a mix of paper from old books to make papier-mache puppets, found objects, and fabrics, all painted or altered to illustrate what it may have felt like to be in Sarg's world." She puts us right there, and makes our lives better for knowing this extraordinary man who may have been virtually unknown to the world until now! "My mother hoped sending me to Stanford University would make me a lady. What would she say if she saw me now, hurrying through the streets of San Francisco to play basketball? I'm sure she'd prefer that I was going to tea on the arm of a handsome gentleman." "Out they come, the only men in the building, The assistant stares at us so intently, he almost knocks the janitor off the ladder! When the basket is secured, the two men make a hasty exit." "Women's basketball continued to grow in the twentieth century, though early on, intercollegiate play was limited by physical educators who worried that female athletes would push themselves too hard in the quest for victory." Agnes Morley was sent to Stanford to enhance her 'lady' skills, something that her mother hoped would be a result of a college education for her tomboy, ranch hand daughter. It wasn't long until she discovered a passion for basketball. She was a member of that historic Stanford team, a skilled athlete and a power passer. Always in motion, and rarely worrying about the ladylike way of doing things, Agnes is the narrator for this short scene from a life well-lived. This first person narrative makes it emotional and immediate for the reader. It is a piece of women's history and might just encourage some readers (or listeners) to forge further in learning about the the role of women in history. Matt Collins adds to the motion and emotion of the story with details that enrich the telling. His knowledge of the era is evident in the tunics and bloomers worn by the women, in the gym where the game is played and in glimpses of the women in attendance as spectators. The way he changes perspectives brings readers straight into the action....the cover is first, showing a player sending the ball skyward while another attempts to block it. From pounding feet making their way down the wooden floor to the in-the-stands perspective of watching from above, to the evident joy on every team member's face when the game is finally won, he brings the game to us and adds wonder to the tale. The back matter is brilliant...with an extensive author's note about Agnes and other team members, a timeline of women's basketball from the invention of the game to the establishment of the WNBA, a list for further reading, two places worthy of a visit if you are in the neighborhoods of Springfield, MA or Knoxville, TN and finally, a team photo from the Stanford archives. ""Fifth grade is probably pretty rocky for lots of kids. Homework. Never being quite sure if you're cool enough. Clothes. Parents. Wanting to play with toys and wanting to be grown up all at the same time. Underarm odor." Here's a book that will stay with me for a long time, and I will be talking about it in classrooms visits. Once started, I just wanted to keep reading. Then, when I had to stop because I could no longer keep my eyes open, it was the first thing I picked up when I opened those eyes this morning. Melody feels like a new, and unforgettable, friend. She has the most severe form of cerebral palsy, which means that she cannot walk or talk. Think? 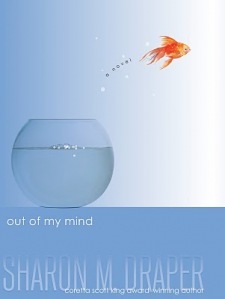 Now, that's another story and the premise for this wonderful book about the power of language and of the human spirit. "When people look at me, I guess they see a girl with short, dark, curly hair strapped into a pink wheelchair. By the way, there is nothing cute about a pink wheelchair. Pink doesn't change a thing. They see a girl with dark brown eyes that are full of curiosity. But one of them is slightly out of whack. Her head wobbles a bit. She's really tiny for a girl who is age ten and three quarters. Her legs are very thin, probably because they've never been used. Her body tends to move of its own agenda, with feet kicking out unexpectedly and arms emotionally flailing, connecting with whatever is close by -"
A computer that lets her voice her thoughts changes her way of dealing with the world, and allows others to see just how intelligent she really is. As a result of that, she becomes a school team member for a quiz competition. Melody allows readers to see the world from inside her head. Her first person narrative is filled with the difficulties that she and her family face on a daily basis, with her resilient spirit that deals with the joys and heartbreaks of being an almost eleven-year-old girl in an often cruel place and with an honesty that is real and touching. Yes,, she is smart. She is also funny and has a charm that will hold her in your heart. This book would be perfect as a classroom read in intermediate and middle years classrooms. It would also work well for novel study with a small group as there is so much to feel, and discuss about this lovely, labelled girl. Starting a book club? It is due out in paperback in May...if you can wait that long! "Then Dickens walks on, surrounded by pickpockets; ladies with shattered hopes; a miserly old man; a young gentleman with great expectations; a proud, heartless girl. There are lawyers, clerks, convicts, and keepers of old curiosity shops." It's always interesting and often enlightening when a special anniversary date is near. There have been a number of new and inspiring books about the Titanic as we approach the hundredth anniversary of its sinking. As well, as we near what would be Charles Dickens' 200th birthday, authors and artists are working to tell his story for a new generation. "...that skinny twelve-year-old, huddled in a doorway, wearing a worn, patched jacket. He is watching the schoolboys with hungry eyes. But though he'd like something to eat, he longs for their books even more. Almost all of his own books, which he loved so well, were lugged to the pawnshop long ago." He is a factory worker who spends ten hours a day wrapping bottles of blacking to prepare them for sale. He loves to tell stories for the other young boys who work those same long hours in harsh, bleak conditions. At the end of each day he goes home alone to a tiny, barren room. His father has gone to prison, unable to pay his debts. Because his mother and siblings have no means of support, they live there with him. 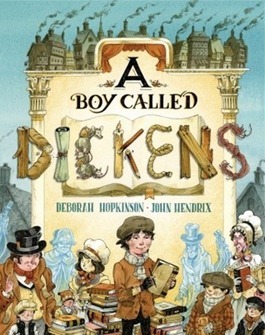 The young Charles is the only wage earner in the Dickens family. His father's release allows Charles a new lease on life...and he embraces it. While working he gave his imagination free rein with characters and storytelling while trying to overcome the drudgery and monotony of his factory work. Now, at school, he is able to read the books he loves and work toward the man he will become. The illustrrations that John Hendrix has created in graphite, pen-and-ink and acrylics clearly evoke the bleak and dim world that is the London that young Dickens experienced. But, there is more to it. As we encounter this world we can see that it has a great influence on Charles Dickens' writing and the books so beloved by readers around the world. The design changes from the dusty drabness of the city to the characters who people his world, and then to the bits of light that ignite a young boy's imagination. While it is a fictional account, it has a close connection to the truth of the life that he lived. "But the only land for sale there cost far more than my father could pay. So he offered to build a big brick house on it, with courtyards, gardens, a swimming pool, and let the landowner have it all - after we had lived there for twenty years. The owner agreed. " This incredibly talented artist tells his story to Libby Koponen (who writes the text) and then creates a magical and complex collage homage to family life following the stock market crash that plunged much of the world into turmoil. "When we moved in, what excited me most was the swimming pool. Only two other houses in Shanghai had pools. and both belonged to millionaires. Baba got the money to build and maintain ours by forming a swim club with other parents who had been educated abroad. After hours it was our own private pool." "I did get braised pork shoulder, plus unimagined fresh fruits from abroad: strawberries, mangoes, bananas so ripe they were almost black, but oh so sweet. Now we realized what we had missed during all those war years." His story is told in short scenes from childhood, memories where every detail is clear. It is a picture book biography that allows his readers to see what life was like for his family, stressful because of what was happening beyond their walls, but fulfilling and memorable because of what was happening within. 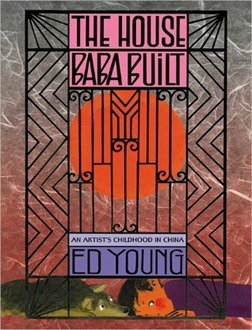 In this inspiring and well-designed book, Ed Young uses foldout pages, vintage photos, maps, and delicate sketched memories to bring his childhood to today's readers. There is so much to see and wonder at; he provides us with a personal and poignant history lesson. ...You may put down as rule No. 1 that life is not rich not real unless you partake life with your fellow man. A successful life and a happy life is one as measured by how much you have accomplished for others and not one as measured by how much you've done for yourself. love Dad."